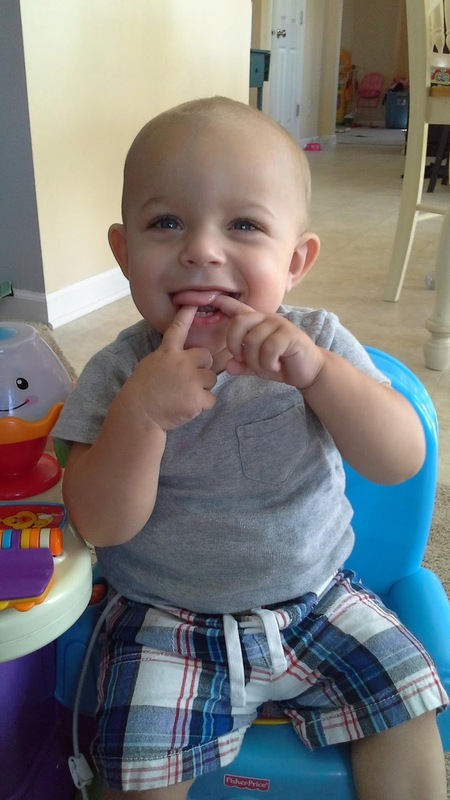 Hudson's Trials and Triumphs : Call From Cincy Children's Hospital! The call today was to say that yes, our referral has been received, things have been hashed out with insurance, and to let us know to wait to hear from scheduling as he will need many many appointments. Such appointments include nephrology, anesthesia, psychology, cardiology, transplant surgeon, ultrasound, social worker, finance, nurse practitioner, nutritionist, and probably more I'm forgetting. They are going to try to schedule all these appointments over two full days. So until then we just wait to hear from the scheduler. We still have no idea at what point testing for a match can begin. We are already praying that the perfect kidney would be found in God's timing. P.S. Can you tell Hudson is teething bad? He's working on a top molar and that 4th bottom tooth. Aside from extra drool and biting everyone and leaving bruises, he's been pretty happy.